Crafting a genuinely all-ages story is a very different thing to creating a children’s comic that also appeals to adults. The latter connects with an older audience by allowing us to revel in a superficial sense of nostalgia for what entertained us in our formative years. The former, however, provides a far more nuanced reading experience. Kids may enjoy its narrative on a direct surface level but for those with a few more years on them the draw will be profounder in scope. That’s what Rozi Hathaway achieves with Njálla, her recently Kickstarter-funded comic which in May made the remarkable achievement of reaching its financial target in just a few short hours after the crowdfunding campaign was launched. 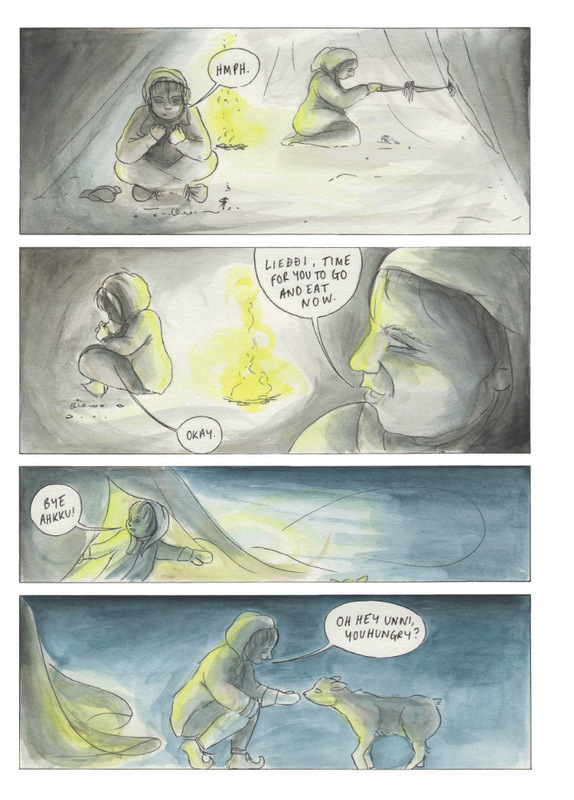 Hathaway was, of course, one of my 2015 ‘Six UK Small Press Creators to Watch’ and, as such, an artist who we have been following with particular interest here in ‘Small Pressganged’ over the last 18 months or so. Njálla takes its inspirations from the myths and legends of the Sámi people, an indigenous culture in northern Europe’s Arctic Circle. Its central character is Lieđđi, a Sámi girl who is part of a nomadic community of reindeer herders. 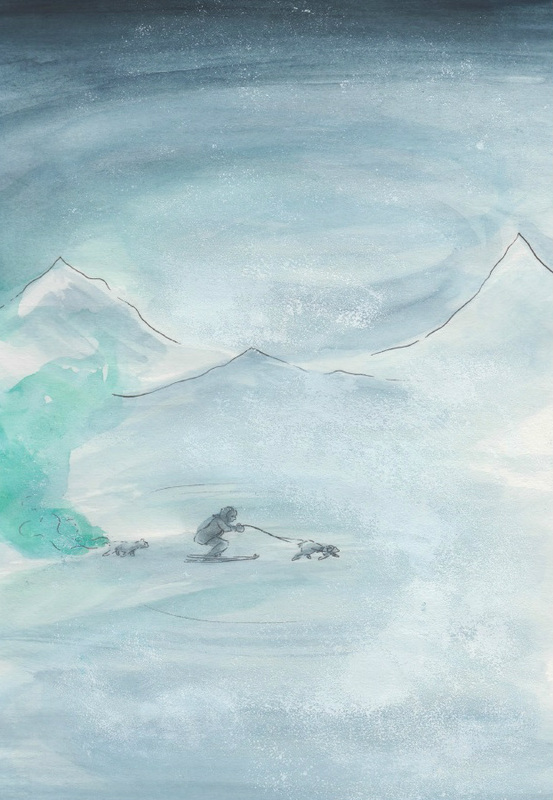 Lieđđi’s childhood friend and confidante is a baby reindeer called Unni whom she chats to as an equal as the pair get into scampish scrapes on the frozen tundra. One of the major draws of Rozi Hathaway’s material to date is her ability to tell stories without undue exposition or excessive dialogue. 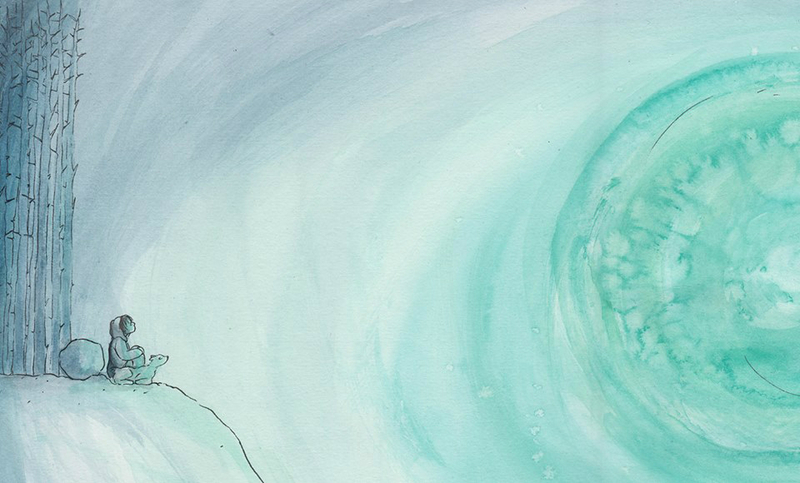 That adeptness at working in perhaps the purest form of comics was very much in evidence in her breakout work in Ravi Thornton’s HOAX Psychosis Blues and her recent offering ‘Afloat’ in the Broken Frontier Small Press Yearbook. Even The Red Road, her first longer-form comic last year, was sparing in word count. So it’s intriguing to see her pushing herself in a slightly different direction on one level in Njálla by making more fulsome use of dialogue and speech balloons. 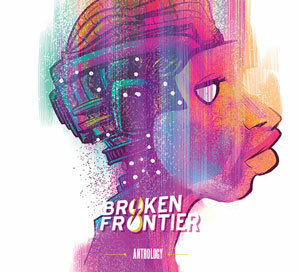 It’s indicative of the approach of an artist who has continually experimented with tone, presentation and subject matter over the last year and published work that has crossed from the folkloric to the humorous through to the autobiographical. That increased verbal interaction between characters is used intelligently not just to further the narrative but also to build up a sense of place, community and characterisation: the chattering, hyperactive excitement of Lieđđi, for example, connecting with the book’s adult audience and reminding them of their childhood sense of wonder at the world. Or her one-sided conversations with Unni that suggest an adventurous free spirit unafraid to break the rules and explore her environment regardless of the strictures of authority. However, Hathaway still knows when to step back and allow her “silent” panel-to-panel pacing evoke a deeper sense of sheer wonder. Check out the scene above for an example of a moment of enchanting magic where words are utterly redundant. 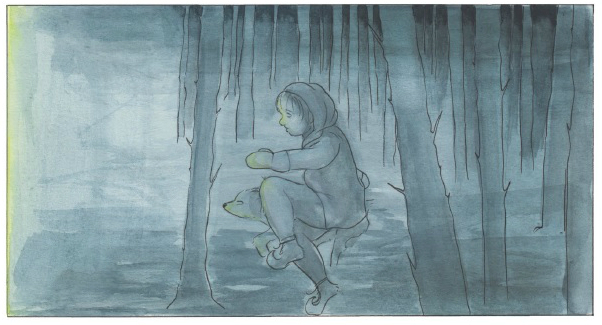 Lieđđi’s theatrical creeping through the dark as she negotiates the outer boundaries of the camp is another fine example (below). Or the later scenes in the book where the coming together of ethereal forces needs no clumsy explanation from narrator or characters to emphasise the majesty of events. Just perfectly crafted visual storytelling where no single panel is wasted and every element works in unison. 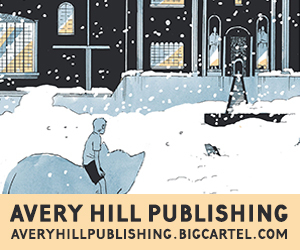 It’s the signature mark of every Hathaway comic to date; that deft and delicate capacity for making an immediate yet gracefully understated connection on an emotional level with her readership. Protagonists morph instantly into avatars on the page as visual characterisation – Lieđđi’s gleeful reactions are a particular joy – immerses us in the cast’s world. Adding to this mystical twilight spectacle is Hathaway’s careful use of colour; the bluish-greenish hues managing somehow to be simultaneously elegantly muted but still awe-inspiringly resplendent. There’s also a sense of scale to the proceedings that adds to the grandeur of the piece as the Sámi characters interact with a desolate yet hauntingly beautiful landscape that is made all the more breathtaking by its otherworldly visitors. For more on the work of Rozi Hathaway check out her site here. You can also follow Rozi on Twitter here. 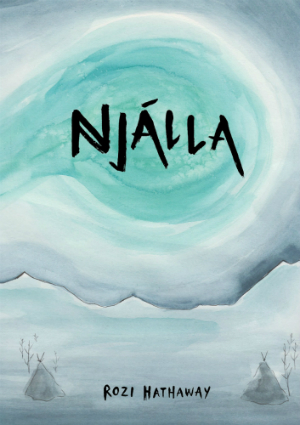 You can order Njálla online from her online store here priced £8.00. Njálla launches on June 4 at Northampton’s NN Café. You can join the Facebook event group here for more details.